First round draft pick Elias Pettersson will hit the ice at Rogers Arena in Canucks colours sooner than anticipated. The Canucks are hosting a new event this summer, as the Canucks Summer Showdown debuts on Thursday, July 6 at 6 pm. The game will feature Canucks prospects competing against each other in 5-on-5, 4-on-4, and 3-on-3 games. The event won’t be fully open to the public though, as season ticket members and invited guests will be the only people in attendance. Fans unable to get a seat can watch the game from the Sports Bar at Rogers Arena or watch the live stream through the Canucks’ official Facebook page. 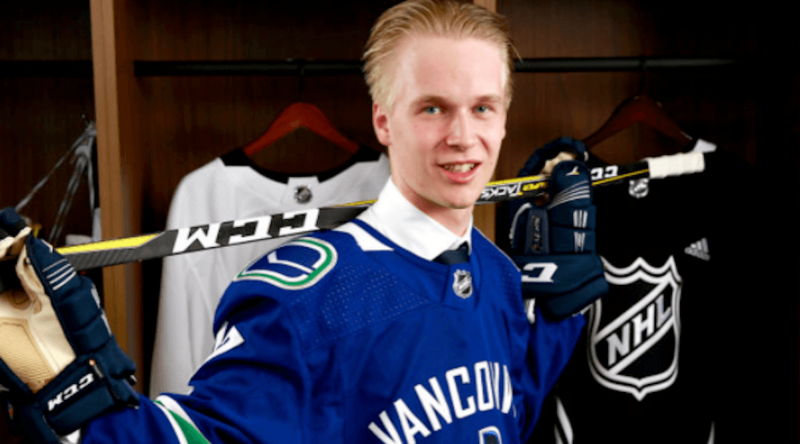 Apart from Pettersson, Vancouver’s previous two first round selections – Brock Boeser and Olli Juolevi – are confirmed to attend. Expect the remainder of players to include players attending development camp (yet to be officially announced), which takes place in Whistler and UBC this year. Attention for Canucks prospects grows every year. Such is life for a team picking near the top of the draft in three of the last four seasons. The annual Young Stars Classic prospects tournament has grown with it, as Canucks youngsters will hit the ice in Penticton again from September 8 to 11, in a sold out South Okanagan Events Centre.